It is finally finished and I love it! I was torn on how to bind it, but I decided to just double fold the backing over and machine stitch it to the front. It doesn't look as nice as a hand stitched binding, but I won't worry about the pup catching her collar in the hand stitching. Here is a close up of the binding. No, it's not perfect, which drives me nuts. It is more functional and sturdy this way I think. Here is a picture of the back all quilted. You can see I machine quilted and went with a geometric pattern. Aren't the bones awesome? I outlined here the quilting I did. I combined a cross hatch pattern with stitching in the ditch. I expect to wash this one a lot, so I wanted it to hold up. 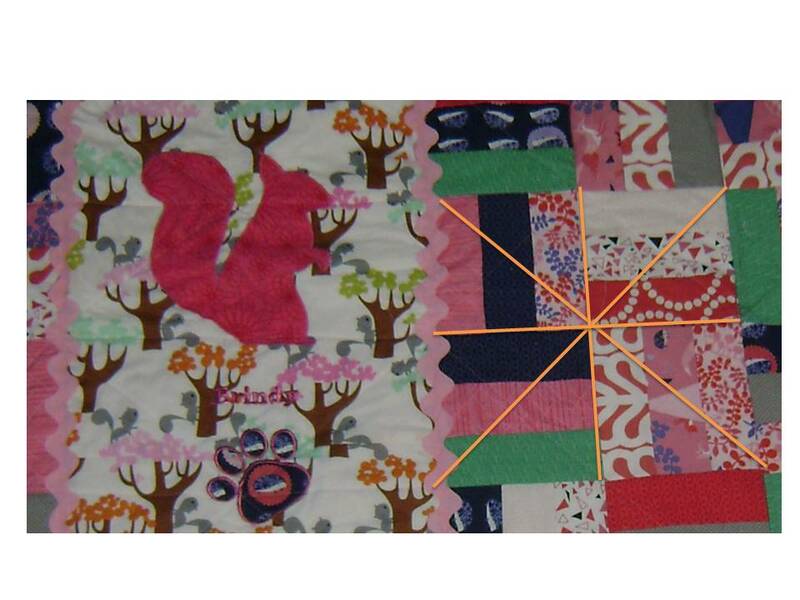 Here is how each square wound up being stitched as well as the outline. I used the same method over the squirrels. I had to think about it, because I didn't want it to look bad, but you can hardly see it. Again, I wanted it to hold up well. The biggest challenge this quilt presented was any time any part of it touched the floor or I laid it out to take a look at it, my boss here hopped on top and tried to nap. I guess that means she likes it. As I mentioned on an earlier post this was inspired by the Simply Spring quilt in the book Simple Choices by Abbey Lane. I am really a beginner, and this quilt was easy all the way through. Highly Recommended! One last piece! 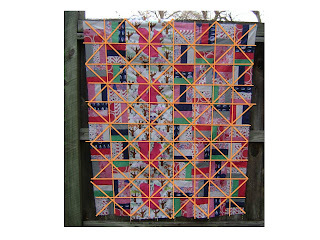 Check out my January Block of the Month Craftsy blocks! I went with the blue and white theme and am very pleased with how they turned out. There is still time to sign up for this free course! OK that is the last on quilting for a while. I know you guys are hungry for garments. I am too! You are so awesome!!!! LUV it chica! Have you ever hit a wall? Are those hot pink squirrels?